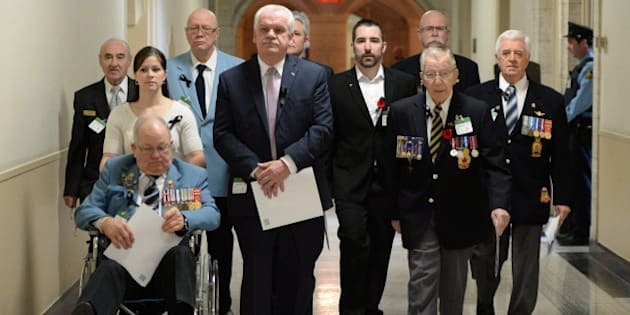 OTTAWA - Some Canadian soldiers given medical discharges find they don't qualify for benefits because Veterans Affairs uses different, more stringent criteria in an "unfair" process, the military ombudsman told a Senate committee Wednesday. Pierre Daigle, whose term ends in a few weeks, said many ex-soldiers have to fight to prove that the conditions that made them ineligible to serve are in fact a result of their service. Once they are released, Veterans Affairs demands that the ill and injured be subject to a separate assessment above and beyond whatever examination has been conducted at National Defence. For veterans it can be a bureaucratic conundrum that often leads to a denial of benefits and a lengthy appeals process. "This is an area of unfairness which needs to be looked at," Daigle said. His comments echo complaints from the country's veterans ombudsman, Guy Parent. Daigle said he has heard from former members directly, even though his mandate doesn't extend to Veterans Affairs, and told senators one individual described the process "as the equivalent of being pushed off a cliff." A spokesman for Veterans Affairs Minister Julian Fantino responded by listing the benefits for which ex-soldiers may be eligible and Nicholas Bergamini also noted that the government has introduced legislation that will give former military members the first crack at federal job opportunities. The delivery of services is also being studied as part of a review by a parliamentary committee, Bergamini added. The Harper government, in defending itself over a series of military suicides last fall, urged soldiers suffering from post-traumatic stress to come forward and seek help. Last week longtime Conservative MP Cheryl Gallant declared that the mental illness stigma soldiers have to overcome "is a stigma within themselves." Stigma is an important obstacle, but the fear of what will happen to soldiers and their families afterwards is real and justified, Daigle said. He noted that 90 per cent of the soldiers assigned to defence support units, where they are supposed to get help, end up being dismissed. Many of them face not only a battle for benefits, but they are kicked out before qualifying for a fully indexed pension. "This is very unfair," he said. "There is a disincentive to come forward." The mechanism through which the soldiers are dismissed is the military's universality-of-service rule, which requires all members to be physically and mentally fit to deploy. Sen. Romeo Dallaire, a former general and a passionate advocate for soldiers with post-traumatic stress, says it's time to revisit the rule. He said he saw nothing wrong in allowing as many as 2,000 wounded or injured soldiers to continue to serve, over and above the existing ranks of 68,000 full-time members. "If industry is going to employ them, why can't we employ them and use that experience?" Dallaire asked. There has been a barrage of stories about the poor treatment of veterans over the last several months. The issue was brought into sharp focus with the closure of eight Veterans Affairs district offices, and revelations that National Defence has failed to fill out its ranks of mental health professionals. The sometimes bitter debate, set against the backdrop of recent suicides, saw calls for the firing of the veterans affairs minister. Dallaire said he's been troubled by what he's seen and announced that the Senate veterans committee will conduct an in-depth review of how soldiers with post-traumatic stress are treated.